Fad-Free Strategy provides a ground-breaking approach to making better business strategy decisions: more efficient, open to out-of-the-box opportunities and evidence-based. 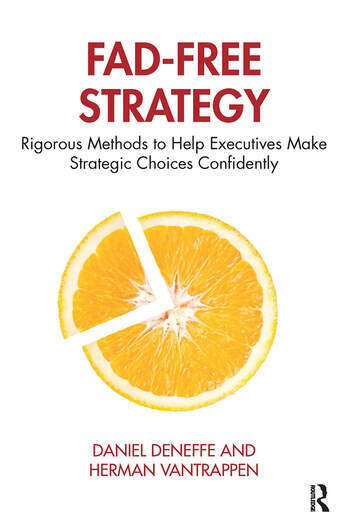 Most strategy books focus on Grand Strategy, the process that leads to high-level recommendations or, more accurately, hypotheses about where and how to compete. While this book briefly covers critical Grand Strategy practices, it deep-dives into Operational Strategy, the process of validation, adaptation and possible rejection of those hypotheses. Operational Strategy is based on an in-depth understanding of customer preferences and anticipating the choices they make. Those choices rather than managers’ ambitions determine whether a strategy will generate the aspired financial results. The book explains, by means of detailed real-world cases across industries, how to generate validated solutions to any strategic problem such as: How to enter successfully into new markets, either as an innovator or as a latecomer? How to defend one’s position against aggressive new entrants? Or how to sustain margins when price is the only thing customers seem to care about? This remarkable book contains expert advice from accomplished strategic advisors and thought leaders Daniel Deneffe and Herman Vantrappen. Fad-Free Strategy will be a useful tool for smart business executives at mainstream companies who are disappointed with strategy fads and simplistic solutions based on cherry-picked, anecdotal evidence from today’s hero companies. It will also appeal to economics faculty members teaching graduate courses in business strategy who are looking for an economics-based strategy textbook that is both rigorous and comprehensive. The book’s core ideas have been taught successfully in continuing and executive education programs at Harvard University and Hult International Business School. Daniel Deneffe is the Managing Director of Deneffe Consulting and a former Partner at Arthur D. Little. He is also a Professor of Strategy at Hult International Business School and teaches Business Strategy in the Real World at Harvard University’s Division of Continuing Education. Herman Vantrappen is the Managing Director of Akordeon, a strategic advisory firm. A former Partner at Arthur D. Little, he has published numerous articles in a variety of journals, including Long Range Planning, MIT Sloan Management Review, Strategy & Leadership and Harvard Business Review.